*The data are classified according to the categories of Indigenous identity as defined by Indigenous and Northern Affairs Canada (INAC). http://www.statcan.gc.ca/pub/91-552-x/2015001/t/tbl04-eng.htm – accessed August 22, 2017. 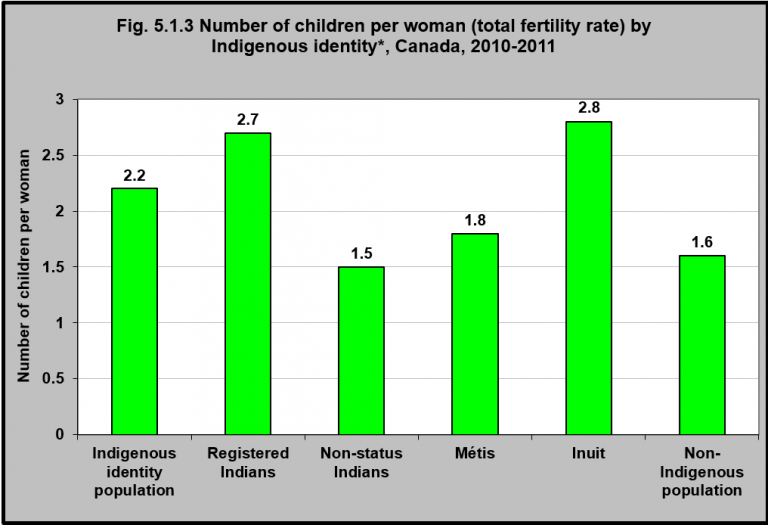 In 2010/2011 the total fertility rate** for Indigenous women* was 2.2 children per woman. This was higher than that of Non-Indigenous women who had a total fertility rate of 1.6 children per woman. The total fertility rate varied from a low of 1.5 children per woman for Non-Status Indian women to a high of 2.8 children per woman for Inuit women. The higher fertility rate of Indigenous women is one of the contributing factors to the young and rapidly growing Indigenous population. As such, it is important that Indigenous women have access to culturally sensitive maternal and child health services in order to give infants the best start in life and to set them on a healthy pathway. Currently, due to a number of barriers, including geographic isolation, limited resources, lack of personnel, and culture and negative experiences with mainstream health services, many Indigenous women do not receive appropriate pre- and postnatal care or must travel to urban centres, away from the support of their families and communities, to give birth.2 Existing data indicate that Indigenous women have poorer maternal health status and maternity experiences compared to non-Indigenous women, and experience disparities accessing culturally secure maternity care close to home and family.3 Health services, programs and policy responses tailored to Indigenous communities could improve maternity services for Indigenous women and improve health outcomes and enhance the well-being of both mother and child. 3Smylie, J. (2014). Strong women, strong nations: Aboriginal maternal health in British Columbia. Prince George, BC: National Collaborating Centre for Aboriginal Health.